FLT has a lot of experience in mattress flow production lines. Flevotech is a market leader and producer of mattress covering machines. We can offer you a customized solution for conveyorisation of your whole factory or for individual production lines. 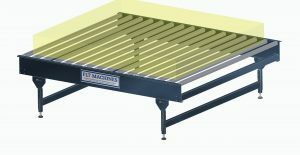 Our range of mattress conveyor systems cover all aspects of mattress production movement. 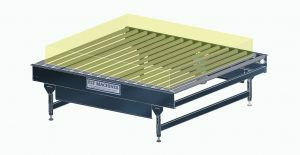 The conveyor tables can also be used for individual supply or unload conveyor for machines like the FLT Mattress machines.